The Museum of Social Justice is dedicated to telling the neglected stories of the diverse people of Los Angeles. By showcasing the history of social movements from the perspective of marginalized groups, the Museum inspires visitors to engage with social justice principles and advocate for change. The Museum carries on in the tradition of the founder’s commitment to social justice issues such as ministry to the poor, abolition, women’s suffrage, and civil rights. A permanent exhibition detailing the Methodist’s long history of championing social justice causes for the less fortunate. The exhibition features dynamic and rarely seen images from the Museum archives, documenting Los Angeles Methodist’s progressive social work and ethnic outreach endeavors during the long period of Los Angeles’ growth. In conjunction with the permanent exhibition, and moving beyond Methodist activities, the Museum will install temporary exhibitions examining past and present social justice activities culled from a wide variety of amazingly rich and diverse ethnic, religious, and racial communities in the city of Los Angeles and beyond. The museum is housed in the historic La Plaza United Methodist Church at the intersection of the Los Angeles Plaza and famous Olvera Street. Thanks to its proximity to some of the finest educational institutions the world has to offer, such as California State University, Los Angeles (CSULA), University of California, Los Angeles (UCLA), Otis College of Art and Design, and California State University, Northridge (CSUN) the Museum has developed a diverse set of educational and social outreach programs to bring opportunities to the community. These programs continue La Plaza United Methodist Church’s 100 year-old legacy of bringing socio-economic and health related equality to all citizens of Los Angeles, through non-sectarian outreach services, knowledge, and empowerment. Methodism is a movement of Protestant Christianity represented by a number of denominations and organizations. It traces its roots to John Wesley’s eighteenth century evangelistic revival movement within the Church of England. Wesley wanted followers who would shape their Christian living by adhering to certain rules: avoiding evil of every kind, such as profanity, profaning the day of the Lord, drunkenness, buying or selling slaves, fighting, and smuggling. Wesley’s followers were to do good as well, by giving food to the hungry, clothing the naked, visiting the sick and prisoners, and instructing, reproving, or exhorting sinners. Some Methodists went to the American colonies and formed religious societies. They shared these lessons with the men and women, free and enslaved, who worshipped in their societies. In 1729, John, his brother Charles, and George Whitefield founded the Holy Club while studying at Christ Church College, University of Oxford. Other students at Oxford ridiculed and branded them “Methodist” for their methodological approach to living a holy life. The Methodist California Conference appointed Rev. Adam Bland as a missionary to Los Angeles in 1853. He leased the El Dorado Saloon, located near the Plaza, and transformed it into a chapel and school for girls. The early ministry to Spanish-speaking people throughout Southern California was very sporadic and lacked cohesion and leadership until the arrival of Vernon McCombs. Dr. McCombs accepted the position of director of Spanish work in Los Angeles in May 1911. He served in that position until his retirement in 1946. La Plaza United Methodist United Church had its humble beginnings as the Bloom Street Mexican Mission in 1910. The church continued in the Methodist tradition of providing social services in the form of mother’s classes, English classes, and a free medical clinic staffed by volunteer physicians. 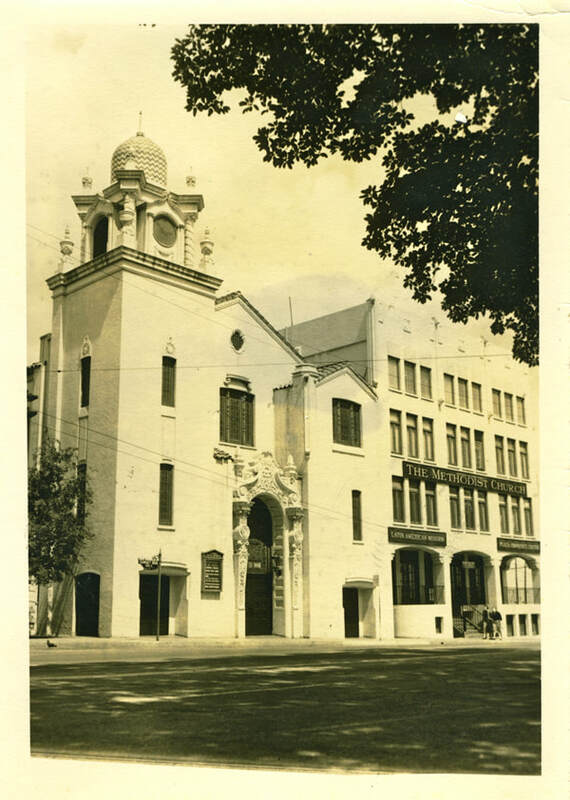 In 1914 the mission moved to a rented hall closer to the Plaza at 110 Commercial Street and was renamed the First Mexican Methodist Episcopal Church. Evangelistic meetings were held in the Plaza and Bloom Street was converted to a free clinic and welfare center. In 1915 McCombs convinced Katherine Higgins to leave a good position in Pennsylvania to head the welfare department. Following vigorous fundraising activity by McCombs and Higgins, the Board of Directors acquired two lots on what was then called Marchessault Street at the Northeast corner of the Plaza in 1917. Two temporary wooden buildings were erected that housed the Plaza Mexican Methodist Church and the Plaza Community Center and the first Goodwill Industries Store in Los Angeles. The present day Church and Plaza Community Center (renamed Biscailuz Building in 1968) were completed in 1926 and 1927, respectively. These two buildings were placed on the National Register of Historical Places in 1981. Due to changing demographics, the Plaza Community Center relocated to East Los Angeles in the 1960s, to better serve the immigrant population. Today, the Plaza United Methodist Church and Biscailuz Building are still used to help serve the local community. One of the most recent major initiatives of La Plaza Methodists, the Methodist’s Los Angeles District, and the California-Pacific Conference (Cal-Pac) was to secure from the City of Los Angeles a renewal of the long-term lease for La Plaza Church building, which had previously been negotiated with the State of California. In 1956, the State began acquiring properties around the Plaza through threat of eminent domain to create a publicly owned historic district. Thereafter, the State ceded control of the El Pueblo Historical Monument to The City of Los Angeles. When the fifty-year lease expired, the City was unwilling to renew the lease officially out of concern for church-state conflict lawsuits. However, pressure from commercial real estate developers to take the church, proved to be an underlying driving force. Rallying to save their historic presence on the Plaza: Plaza Church members, the Methodist’s Los Angeles District, Cal-Pac Conference, scores of interdenominational, ecumenical, non-sectarian supporters across the city-religious leaders of across-section of faiths, political and civic leaders, historical preservationists, unions, and the public at large-came together to persuade the Los Angeles City Attorney to negotiate a new long term lease with the Methodist leadership. It was so ordered and the lease was approved in November 2011. The lease was predicated upon the opening of a new museum and educational center in La Plaza United Methodist Church that would interpret for the general public and El Pueblo visitors, both the history and historical context of its Methodist social justice heritage, as well as offering a nondenominational and non-sectarian slate of exhibits, programs, and educational outreach. In doing so, the Los Angeles United Methodist Museum of Social Justice was born. PLEASE SUPPORT OUR EFFORT TO TELL THE UNTOLD STORIES OF LOS ANGELES FROM THE PERSPECTIVE OF THE MARGINALIZED.